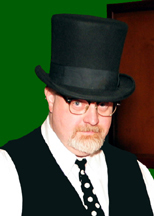 Over the years, Michael Baker has won many awards for his magic. Among the most noteworthy, he won first place for close-up sleight of hand at the Atlanta Harvest of Magic in 1997 & 1998. His original magic was featured in articles known as, "One Man Parades" in The Linking Ring, the official magazine of The International Brotherhood of Magicians. These articles appeared in the June 2002 & March 2003 issues. For these articles, Michael was awarded the highly coveted, Howard Bamman trophy for "Best Parade".